The Amusin’ Ice Cream Van Shorty Romper from Rockin’ Baby melts hearts at My Baba as it is included in a super-cute baby fashion round up. Keep little ones cool on warm summer days with this fabulous retro ice cream van print. Beep beep! Mother & Baby are going bananas this month for fruity clothing, especially the Applique Babblin Romper from Rockin’ Baby. Dress your little one in bright summer colours for warm sunny days ahead and add a fresh fruity touch with the sweet Banana print. The incredibly cute Ridin’ Rocket applique T-shirt from Rockin’ Baby has launched into Living North as a Spring essential. Credited for their stylish, high quality kidswear, and also for their charitable success; we are ready to take-off with joy! The Rockin’ Baby Esme Dress is true boho chic in The JC’s Edge fashion magazine. Let little ones join the tribe with tassels and floaty designs. The perfect addition to every summer wardrobe, it’s time to go on holiday and have some fun! My Baba are loving the Rockin’ Baby animal prints new to the SS16 Collection that are getting everyone in the mood for the upcoming Jungle Book movie. The gorgeous new rainforest collection will have all little cheeky monkeys looking cute and swinging into Summer in style. The bare necessities of life will come to you! The Huffington Post are delighted to share news of the Rockin’ Baby clothing drop in Uganda. The charitable children’s clothing brand are credited for making a difference to impoverished kids around the world. 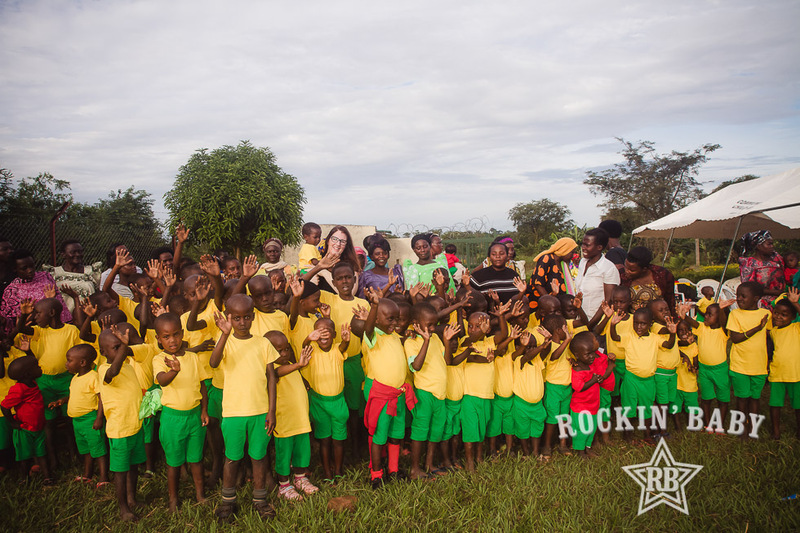 Including pictures and quotes from the tremendous trip, the article is proud to celebrate Rockin’ Baby for their success in Uganda and planned trip to Sierra Leone! The Rockin’ Baby clothes drop in Uganda is celebrated in Drapers ‘Off the Record’ for gifting two thousand new items of clothing to children in Kampala in partnership with ChildFund International. The brand new ponchos from Rockin’ Baby have made a splash in the most recent issue of Little London. Whether it be April showers or a soggy summer, get ready to brighten up those dull days with these hip new ponchos and matching welly boots! It makes us very happy to see Little London Magazine share the Rockin’ Baby clothing drop story on the front page of their website. They were proud to share news that the children’s clothing brand have been ‘Rockin’ And Givin’ All Over The World’; most recently with their trip to Uganda where 2,000 items of clothing were donated to impoverished children. Sharing is caring! The sweet and seasonal Penguin Pyjamas from Rockin’ Baby have featured in a ‘slumber party ‘ feature in Prima Baby & Pregnancy! Comfy and cosy, these pyjamas are perfect for those cold winter nights – they are practically designed for snuggling!